What Causes Magnetic Arc Blow? Magnetic arc blow results when there is an unbalanced condition in the magnetic field that surrounds the arc. There is an interaction between the magnetic field generated by the current in the arc and the surrounding field which in turn causes a force which displaces the arc. As an example, if the welding arc current is 200A and the arc mean diameter is say 5mm then the tangential field can be calculated as 160G. This field will interact with any magnetic materials or magnetic fields in the vicinity of the arc. Where does the magnetism come from? Cutting, NDT, Lifting or Storage? There are a number of sources of magnetism. As pointed out above the passage of current through a conductor or a plasma arc generates a magnetic field. Other sources of the magnetic fields include, pick up from the earth’s magnetic field, induced fields caused by plasma cutting and magnetic domains induced by handling with electromagnets. Another source of problem is magnetic flux leakage (MFL) testing, where zones are taken to magnetic saturation during the test. v The residual magnetism induced can be very high, as much as 100G in air, 10,000G in the material. Zeromag, with its dynamic local control of demagnetising is very good at solving arc blow problems caused by MFL testing. What level of magnetic field will cause problems? This does depend upon the welding process and the geometry of the job. See this table for what field levels affect which weld types. Our product, Zeromag reduces the field to typically 1 Gauss. How can I test for residual magnetism? Any magnetic field meter (gaussmeter) with a thin probe suitable for inserting into a weld prep and with a sensitivity of better than 1 Gauss will be suitable. Diverse manufacture a magnetic field meter MF300H+ with a thin stainless steel probe ideal for measuring in a weld prep. Can I get rid of the magnetic field? A rough and ready method is to use a welding set as a power supply and try to induce an opposite field reducing the net field to zero. This hit or miss method is slow and does not work well if the field changes along the path of the weld. It can make the residual field worse. De-magenetise the material. This can be done, but often the structures are large and the net result is that the time taken to degauss becomes excessive. Diverse’s Zeromag ZM100A dynamically nulls the magnetic field as the welding progresses. The field causing the problem can change in magnitude and sign and it will automatically be reduced to zero and kept at zero throughout the weld process. What about related problems such as aluminium smelters? Aluminium smelters have electrodes with very high currents. These can produce very high magnetic fields, typically 1000 Gauss. Special techniques are required to overcome the field – call Diverse to discuss in detail. Before the onset of arc blow, there are issues with the arc stability, and with the arc being bent by the field. This will inevitably lead to a reduction in weld quality and welding speed. 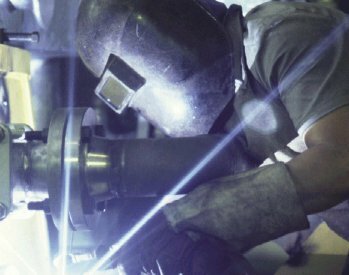 In this situation, Zeromag should be used to reduce the field so that welding can proceed at full speed. Having the correct Zeromag kit will save money as there will be no project delays due to grinding out of poor quality welds.